1. At Fawkner, you pick them up from the office, not the crematorium itself. If you catch the train there, the office is in a non-intuitive location, back towards Sydney Road. 2. Make sure you have photo ID. I guess they don’t want just anybody making off with ashes. 3. The ashes and their container are heavier than you might expect. Well at least, they were heavier than I expected. 4. The ashes are inside a plain grey plastic container, not an urn. I guess everyone’s tastes in urns is different. The container is quite well secured; I haven’t figured out how to open it yet (have no wish to, just in case anything spills out accidentally or I can’t figure out how to seal it again). 5. The container is inside a cardboard box. 6. 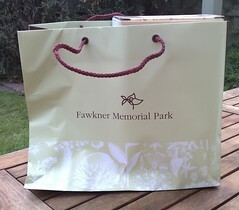 The cardboard box, in turn, is inside a tasteful “Fawkner Memorial Park” shopping bag. Unless anybody looked closely and read the name on the bag or the sticker on the top of the box, they’d probably never guess what you had in that bag. 7. Fawkner included a list of options when they sent the letter to let me know they could be collected. It’s notable that some of the memorial options include 25 year tenure, and some (more expensive) are perpetual. From the looks of it, you can upgrade, too. We haven’t actually sorted out what will happen to the ashes yet — we’re looking at options in Queensland, where Dad grew up. Sydney, London. Scourge of the 1950s establishment. Born 1931 Thursday Island passed away 16 August in Melbourne. Loved father of Daniel and Susannah; dear grandfather of Isaac, Jeremy, Leo, Isolda. One of his good friends assumed the scourge reference was something Dad specified himself, but in fact we put it in on a whim, based on what we knew of his battles in the 50s. I’m glad we did. Greatly valued old friend of Louis Green (dec). Thank you John for your friendship all these years, sometimes as a crotchety mentor, always as a fellow traveller searching to understand life. You always wanted to believe that there was somewhere else with the final answers; I think you might just be there now, secure in the love you always had for your children and grandchildren. Dr Louis Green passed away in 2008. Oh, and here’s a link to The Chinese Diaspora in Torres Strait, which on page 65 notes that my grandfather Chong Quin Lem was recorded as being a storekeeper on Thursday Island in 1911. How’s that for a bit of family history? ← Previous Previous post: Truck rollover at Flinders/Spencer. Again. Yeah, is a bit confronting looking at a plastic container with one of your parent’s “remains” so to speak. My dad’s ashes are scattered around the back garden. My mum’s ashes are still in a cupboard – probably use them to fertilise the tomato plants this year and think of her as we eat the crop! It’s been over a year since I took my Farther’s ashes home (plastic box inside a felt bag) and I keep trying to think of a appropriate place to release them but without success, one day hopefully I’ll be inspired and have the opportunity to do something he would have liked, though I think if he had the choice the tomato plants would be high on the list. It’s interesting how much your observations echo mine after the passing of my Mom last year, down to the “wow they are heavy” bit. It’s striking the extent to which the presentation of ashes in Victoria, Australia is similar to that in New Jersey, US, down to the tasteful shopping bag (as if we’d been patronizing a pricey shop). I do recall getting a rundown from the funeral director on the choices available to me, and the practical implications thereof. (Metal containers won’t pass muster with airport security, and that’s one piece of luggage you definitely don’t want to check). Mostly I recall the sense of surreality of having to make these practical choices on The Day After. Like you all I received my sons ashes in a plastic container (remineded me of a ‘sharps’ container), wrapped in a felt draw string bag and then a high class ‘shopping’ bag. We scattered his ashes at a very special place interstate. No problems taking them on as carry on luggage on the plane. The big ‘moral’ problem I had was disposing of the empty plastic container afterwards. I didn’t know what to do with it. It was certainly not a ‘souvenier’ I wanted to keep. Days later after a short break of relaxing / mourning we were about to fly back to Melbourne and I had been carrying empty the container with me for some days in my backpack. My wife said I shouldn’t take it back with me. I didn’t know how to dispose of it with any dignity. I knew I would be able to take it to practically any undertaker and that they would take it as a community service, but I didn’t know of any as I was interstate. I thought of popping it in a recycling bin – but thought that this might not be enviromentally responsible. The same reason I dismissed the idea of filling it with a bit of water and setting it out to sea. In the end I threw it in a rubbish bin out the front of a milk bar and then lied to my wife about taking it to a funeral parlour. This has played on my mind since – both the lying and the putting it in the bin. However I am guessing if I had actually returned it to a funeral parlour they too would have just thrown it in a bin. When a friend of mine died, the widow asked me to move the ashes from the box to a container, since she couldn’t figure out how to open the grey plastic box. This box had an inset lid on one end, and had to be pried open with a dull knife. which to my horror, (and the assembled crowd) slid in about 5 inches once the gap was made. The lid goes back on with ease, FYI. Good news, the remains are sealed in a plastic bag inside that plastic box. So there’s one more layer left.